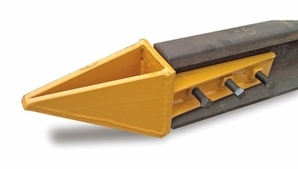 Helps prevent end of rail from plowing up ballast or paving during rail-laying. Wedge shape glides easily over rough ground. Shoe bolts to existing joint bar holes in rail 90-115 lbs/yd. Shoe can be custom made for any specific rail size.